Canton, 2 @ Marshfield, 0 – Final – Canton scored once in each half to finish the regular season with two points on the road. Junior Griffin Roach opened the scoring in the first half while classmate Paul Corcoran converted a feed from sophomore Simon Cruz in the second half. Canton vs. Andover – Postponed to Tuesday, 10/31 at 4:00. Sharon, 5 @ Norwood, 2 – Final – Ally Filipkowski closed out her high school career with a goal and three assists to lead the Eagles to a non-league win at Norwood. Fellow senior Fallon Pfeifer had a pair of goals and senior Sabrina Robbins scored one for Sharon, while sophomore Marika Fillon added one as well. Foxboro, 4 @ Attleboro, 0 – Final – Foxboro raced out to a 3-0 lead by halftime and never looked back, picking up two points on the road. Hussein Kafel scored both of his goals in the first half while Nic Biegel also found the back of the net in the opening stanza. Cam Cass added a goal in the second half for Foxboro. Shane VandenBoom had two assists in the win while Cass and Dylan Barreira each had one. Canton, 0 @ Oliver Ames, 1 – Final – Oliver Ames James Gillespie scored early in the second half to help the Tigers beat visiting Canton. Gillespie converted after a touch from Nathaniel Cardoza off of a long throw from Chris Lawrence. Jack Carroll came up with a big save late to preserve the win. Sharon, 1 @ Franklin, 1 – Final – Franklin took the lead in the first half but Sharon senior Tyler Goldstein pounced on a loose ball inside the area in the final minutes to net the equalizer. North Attleboro, 0 @ King Philip, 4 – Final – King Philip got off to a strong start with senior Thomas Lugten netting a pair of goals inside the first 10 minutes as the Warriors handed North its first loss of the season. 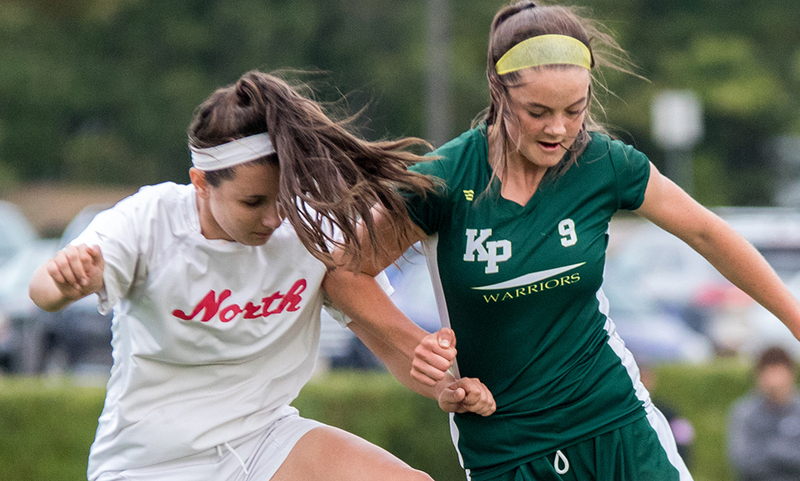 Senior Tyler Mann and freshman Ajae Olsen scored second half goals for KP. Milford, 2 @ Mansfield, 2 – Final – Milford twice took the lead on the road, but Mansfield responded each time to earn the draw. The Scarlet Hawks took a 1-0 lead in the 16th minute when sophomore Walisson de Oliveira buried a free kick from just outside the area. Mansfield tied the game when Jared Gabrilowitz converted a corner from Luke Savoie in the 24th minute. Milford went back on top in the 32nd minute when Claudio Da Silva sprang de Oliveira on the break and he scored. The Hornets grabbed the equalizer with just seven minutes to play with Nick Hyland heading in a throw-in from his brother Sam. Stoughton, 1 @ Taunton, 5 – Final – Taunton junior Brett Beaulieu scored a hat trick to lead the Tigers to their first Hockomock League since October 2015, snapping a 32-game skid. Beaulieu scored one unassisted while the other two were set up by Alec Nunes. Beaulieu also had an assist, setting up classmate Charlie Fiske for his first career goal. Junior Evan Melo capped the scoring on a feed from classmate Noah Leite. Oliver Ames, 0 @ Canton, 2 – Final – Freshman Olivia Rodman scored a brace for the Bulldogs to pick up two points against OA. Fellow freshman Elisa Diletizia assisted on the opening goal and Sarah Collins got the assist on the second for Canton, which moves within three points of first place North Attleboro. OA coach Britt Sellmayer said that Emily Nosalek and Regan Benton played well for the Tigers. King Philip, 1 @ North Attleboro, 1 – Final – Click here for a recap and photo gallery of this game. Mansfield, 4 @ Milford, 2 – Final – Emily Vigeant continued her scoring streak for the Hornets with a pair of goals, while Stephanie Kemp and Cassidy McMahon also got on the score sheet for Mansfield, which moves back into a first-place tie with King Philip. Leeanne Kibbee scored for Milford off a Maggie Boyle assist and Madelyn Boyle added the second for the Hawks. Freshman goalie Carley Ferreira made four saves in the loss. Taunton, 1 @ Stoughton, 1 – Final Angie Lynch scored the lone goal for Taunton, assisted by Maggie Sullivan, and Grace Pimenta made four saves in the Tigers goal. Stoughton’s goal was scored by Chinazo Odunze off an assist by Nicole Weir. North Attleboro, 1 @ King Philip, 3 – Final – In a battle of division leaders, King Philip emerged with a 25-20, 25-19, 23-25, 25-22 win at home. Sydney Phillips led the way with nine kills, six digs, and six service points while Michaela Palumbo added eight kills and 11 service points. Elise Pereira also had 12 digs, 12 service points, and two aces and Julianne Rando finished with 11 digs, seven service points, two kills and two aces. North Attleboro, 168 @ Attleboro, 163 – Final – Attleboro swept the season series with rival North Attleboro, edging the Rocketeers by five strokes at Highland Country Club. Kyle DelSignore earned match medalist honors, carding a low-round of 39. Corey McKenna shot a 40 while Ethan Johnson and Taron Mills each shot 42. Matt Wanless led North Attleboro with a round of 40. King Philip, 153 @ Oliver Ames, 147 – Final – Oliver Ames withstood a strong test from visiting King Philip to card a six-stroke victory. Eric LeBlanc and Matt Kelley led the way for the Tigers, each shooting 36, while Ryan McGarry carded a round of 37. Sharon, 172 @ Stoughton, 189 – Final – Sharon’s Corey Carter and Stoughton’s Brendan Campbell shared match medalist honors, each carding a round of 40 at Easton Country Club. Franklin, 165 @ Milford, 168 – Final – Franklin senior Jason Collins shot a low-round of 39 to earn match medalist honors while classmate Bryan Woelfel shot a 40 to lead the Panthers to the win. Riley Lynch and Andrew Fauerbach each shot 41 for the Scarlet Hawks.